The Roasting Party burst onto the scene in 2013, achieving a rapid growth that’s the envy of many a roaster. This year alone has seen a move to much bigger premises in Winchester, while a new 25kg roaster’s on order to replace the faithful Probat, which features in The Roasting Party’s logo, but is fast reaching capacity. Although a new name over here, The Roasting Party’s roots go deep, Kirby and Wes having decades of experience in the Aussie speciality coffee market. Unusually, the company’s foundations are in squash, where both Kirby and Wes competed at a high level as juniors. From there, Kirby worked in the squash club’s café in Sydney before meeting Ed, The Roasting Party’s third founding-member (the reason you hear less about Ed is that he’s still based in Australia). This led to them all working at Sydney roaster, The Little Marionette, where they cut their speciality coffee teeth. The Roasting Party came about when Kirby’s wife, a doctor, moved to work in the UK. Kirby, who describes himself as more barista than roaster, quickly brought Wes over to do the roasting, and The Roasting Party was born. In three years, it’s more than doubled in size, with Will, Matthew and another Ed all joining. New recruit Luke, who started this month, takes the head-count to seven. Kirby describes The Roasting Party as an old-school roaster compared to some in the UK coffee scene. Known for its espresso blends more than its single-origins, Kirby’s happy to let the coffee talk for itself. Instead, he’s much more focused on the business side of things, an attitude at odds with the “party boys” image. This, however, is a legacy of the years in Australia: whereas many roasters are driven by a passion for coffee, with the business-side coming afterwards, The Roasting Party was always a business, albeit one which roasted great coffee. This, perhaps more than anything, explains its explosive growth. While The Roasting Party’s business model is by no means unique, it’s one I don’t often see. Talking with Kirby, he constantly stressed the word “partnership”. Whatever we discussed, it always came back to partnerships. The Roasting Party doesn’t just roast coffee, ending its involvement when the bagged-up coffee heads out the door. Kirby views the coffee shops The Roasting Party supplies more like partners than customers. The Roasting Party is very hands-on, dealing with all aspects of the coffee shop business, from equipment supply to fit out. It’s not uncommon to find Kirby literally rolling up his sleeves and getting stuck in when a new shop is being fitted out. Similarly, if you visit in the first week or two, chances are you’ll see Kirby or Wes (although not Wes so much these days since he’s too busy roasting) behind the counter, pulling shots. It’s fair to say that with all this talk of partnership, Kirby’s not a fan of the multi-roaster model, or of guest roasters. As a customer, while I enjoy the variety that they bring, I can see his point. The Roasting Party is happy to produce bespoke blends and supply various single-origins, so Kirby would rather work with people than see them go elsewhere. There’s a degree of pride, ownership even, in Kirby’s voice when he talks about the coffee shops that The Roasting Party supplies. The Roasting Party’s success is based on their success: he wants them to thrive. Which, if you think about it, makes sense. If all your customers double their volumes, then so do you. When all’s said and done, it’s a surprisingly simple and successful business model. December 2016: The Roasting Party has won the 2016 Best Roaster/Retailer Award. April 2018: The Roasting Party has opened its first coffee shop, Party on Pavilion. 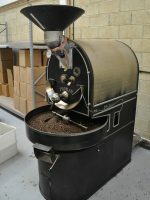 This entry was posted in Meet The Roaster, Roastery, Winchester by Brian Williams. Bookmark the permalink.